want to know everything the internet knows about a person just by looking at them? want a gps overlay for geo-caching? if its sounds far-fetched or if your thinking its a future concept.... think again. 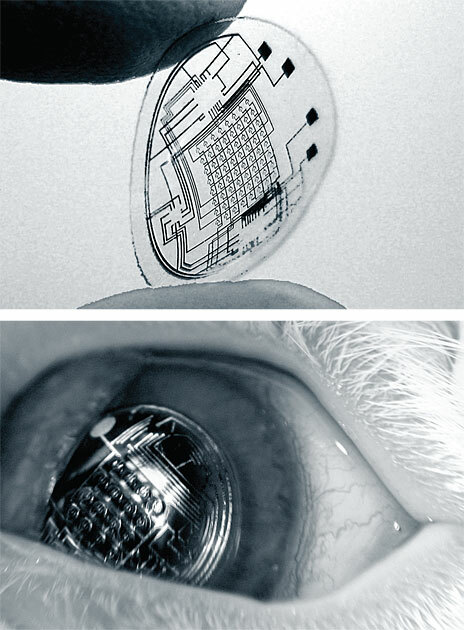 Babak A. Parviz, bio-nanotechnology expert at the University of Washington, in Seattle has been testing special bionic contact lenses which have near-microscopic CPUs embedded in them to send and receive visual information on rabbits for over a year. Parviz, says it is totally feasible to build an augmented reality interface to slip right atop your eyeball. Since the lens reads visual data (the direction and focus of your eye) as well as displays it, he doesn't think a command interface will be a problem. And since the amount of power needed is so small that it could be entirely provided by a microscopic solar array embedded right there in the lens, power supply is not an obstacle either.